A win for the Blue Samurai in the penultimate round of Asian zone matches would see the Group B leader guaranteed a place in next year's World Cup finals. 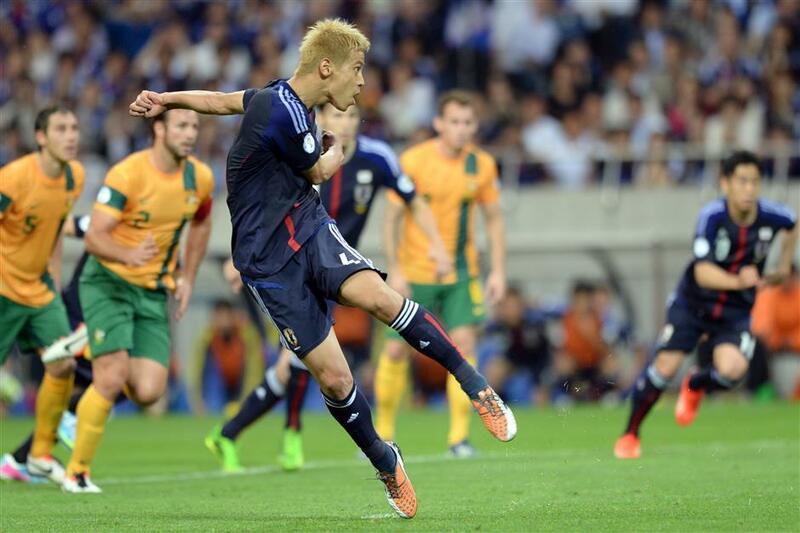 Japan's Keisuke Honda scores from the penalty spot during their Group B Asian zone qualifier for the 2014 World Cup against Australia in Saitama, Japan, in this June 4, 2013, photo. Midfielder Honda is out to be a hero again for Japan against Australia in their crunch 2018 World Cup qualifier at the same Saitama stadium on August 31, 2017. Keisuke Honda is out to be a hero again for Japan against Australia in Thursday's crunch World Cup qualifier while South Korea will hope to secure a berth in Russia next year. Midfield stalwart Honda's 91st-minute penalty at Saitama four years ago secured a 1-1 draw against the Socceroos and with it Japan's place at Brazil 2014. A win for the Blue Samurai in the penultimate round of Asian zone matches would see the Group B leader guaranteed a place in next year's finals. Any other result would leave its fortunes in the balance ahead of its final game against second-placed Saudi Arabia in Jeddah next week. Japan leads third-placed Australia by just one point, with the Saudis, who face the United Arab Emirates in al-Ain on Thursday, also a point behind. The former AC Milan midfielder Honda, 31, who now plays for Pachuca in Mexico, is not an automatic choice for Japan these days but is itching for a chance to repeat his heroics at the same Saitama stadium on Thursday. "My intention is to be in the starting 11," Honda told reporters after training on Monday. "Obviously the situation is different to what it was four years ago but the essence is the same. There are no mind games. We just have to be bold and get the job done." In Seoul, South Korea faces already-qualified Iran needing a victory that could see it qualify from Group A if struggling China keep its miniscule hopes of securing a playoff place alive by beating third-placed Uzbekistan in Wuhan. Manager Shin Tae-yong is boosted by the return to fitness of Tottenham Hotspur's prolific striker Son Heung-min, who made his first start of the season on Sunday after breaking his arm against Qatar in June. Iran is already guaranteed to top Group A, but manager Carlos Queiroz vowed his side would not take its foot off the gas as it aims to preserve its unbeaten record. China languishes at the bottom of the group and needs to win both its remaining games, and hope other results go its way, to have a chance of making the playoffs. Manager Marcello Lippi has urged his players to believe "the impossible may happen" despite only recording one win in their eight qualifying matches. The top two in each of the two Asian zone groups will qualify automatically for Russia 2018, while the third-placed teams will face playoffs.